Enlightenment was originally a desktop manager application for X11 systems. It was first released in 1997 and has come a long way now. It is combination of some wonderful applications and has emerged into a fully fledged desktop environment. All the working of Enlightenment and its applications are handled using EFL (Enlightenment Foundation Libraries). These libraries are being used by many developers all around the world to develop their desktop or mobile applications. This desktop environment is simply called “E”. The most recent version of this desktop environment is E20, let’s see how to install it on Ubuntu 15.04 operating system. The installation process for this desktop environment is pretty easy, launch your system terminal and run following command to add its PPA to your system. 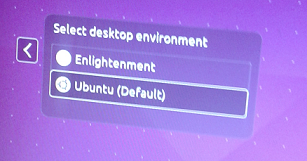 There you go, run following command to install Enlightenment E20 on your Ubuntu system. Congratulations, Enlightenment has been installed successfully. Logout or reboot your system and you should be able to see it added to your logon screen, choose Enlightenment from here while logging in. Here is how Enlightenment environment looks like, neat and clean. Start using this wonderful desktop system. Enlightenment has evolved into a feature-rich desktop environment. It has proven to be lightweight, and mature environment and has captured lot of popularity and user base. It’s under consistent development and getting many positive reviews. It libraries are making developer’s life easy by providing amazing features.